I'm the type of person who will thematically link what I am wearing to what I am doing. If you are a frequent reader, you probably already knew that. It's just so much fun to challenge myself to find something that has a connection to where I am going or what I am doing. Some things are easy. For example, if I am by the ocean, a nautical themed print or something with marine life will fit the bill. Others are a bit more of a stretch. For instance, a few weeks ago I went wine tasting and I donned a skirt with leaves that resembled grape leaves. Dressing to go to a museum is easy with all the painterly prints offered by designers over the last few seasons. I certainly have my fair share of prints that match this description hanging in my closest, but on today's trip to the museum, I went even more literal. 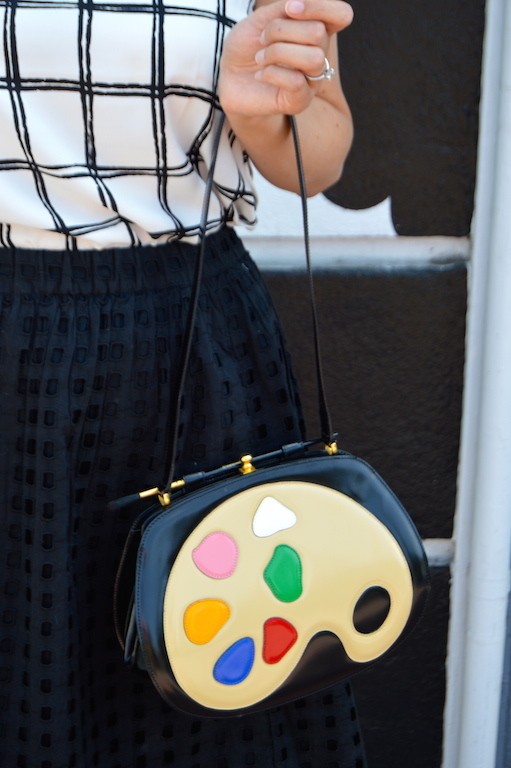 What could be more perfect for going to a museum than a bag that is constructed to look like an artist's palette? The above bag is by Moschino, which I purchased from ebay about five years ago. I am not quite sure when it was made, but my guess is that it was produced during the 80s or early 90s when Moschino was designing all sorts of quirky bags in the shape of everything from houses to milk cartons to footballs. (If you know anything about it, please let me know.) It amazes me that despite the age of this bag, it came with its original Moschino paintbrush, which you can see if you look at the pictures closely. It's actually a real paintbrush, but I don't think I would ever dare paint with it! Although my bag may be from decades past, Moschino has continued their tradition of creating fun, quirky bags, shoes and accessories that always have an unexpected, playful twist. They also are big on using lots of color, which is something I adore as well. 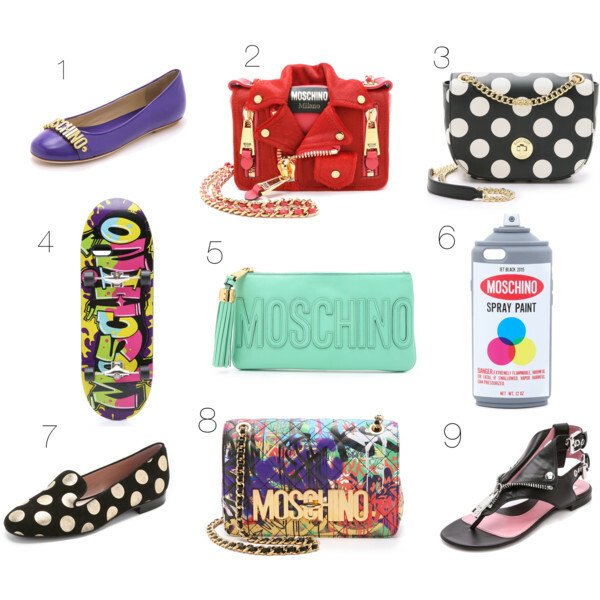 Below you will find a handful of my favorite Moschino items for the current season. I love your outfit. That skirt looks so ladylike and classy. Also love that bag, so cute and fun. Oh that bag is wonderful right down to the brush! It adds such the right amount of quirky detail to a fabulously elegant outfit. Really artfully dressing. Such a cute look! What an adorable bag, too. Great gfind! 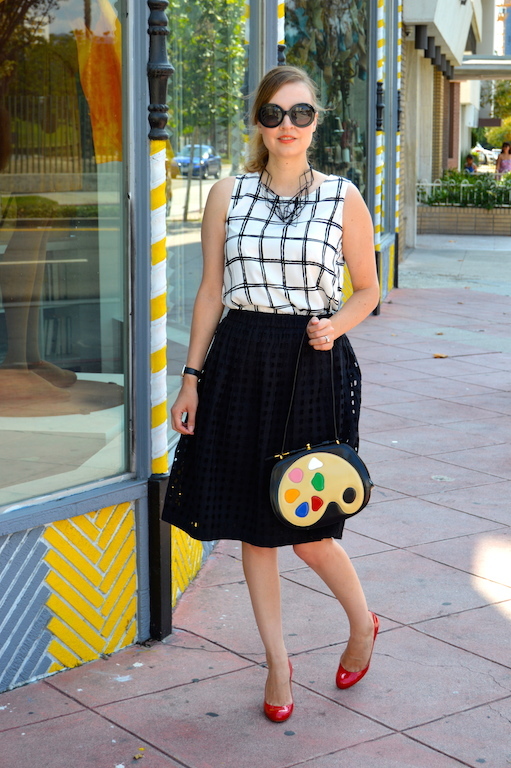 That bag is adorable and such a fun accessory for this classic outfit! your handbag is such fun and great link to the museum. Your top goes so well with your skirt to, great pairing! Thanks so much for linking up today with THT whcih I'm co-hosting. Please can I remind you to follow our social media links, we would really appreciate it. Thanks so much. Great look!!! Such a fun purse. Your accessories are so cool! I want that bag - so fun and unique, as well as the necklace which has an artsy feel! I really love your outfit! It's so cute! I love that top and skirt. Your outfit is so classic and I just can't get enough of it! Every detail in this outfit is spot on! That bag is amazingly awesome. That is so cool, I actually didn't know that you dressed for the occasion. You are the Ms. Frizzle of the fashion world..in a good way as I loved her themes too. We were on the same wavelegth with red black and white and so aprapo with the super cute clutch for the museum! ok HOW fun is that bag?? love!! Awesome look with fun cool bag!